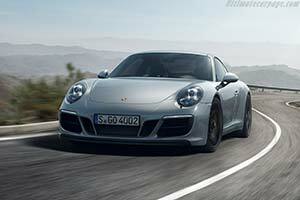 Porsche is expanding the 911 product line with the GTS models. From March 2017, a total of five variants will be available in Germany: the 911 Carrera GTS with rear-wheel drive, the 911 Carrera 4 GTS with all-wheel drive - both of the above availa-ble as a Coupé and Cabriolet - and the 911 Targa 4 GTS with all-wheel drive. A newly developed turbocharger for 3.0-litre six-cylinder flat engine increases power to 331 kW (450 PS). The engine delivers 22 kW (30 hp) more than the 911 Carrera S and 15 kW (20 hp) more than the corresponding GTS prior model with a naturally aspirated engine. All variants are available with a manual seven-gear transmission or optional Porsche Doppelkupplung (PDK). The maximum torque of 550 Nm provides even better acceleration and elasticity figures. The torque is available between 2150 and 5000 rpm. Porsche Active Suspension Management (PASM) is included as standard on all GTS models. The GTS Coupés feature the PASM sports chassis, which lowers the body by ten millimetres. The fastest sprinter in the family is the 911 Carrera 4 GTS Coupé: With Porsche Doppelkupplung (PDK) and the Sport Chrono Package as standard, it races from zero to 100 km/h in 3.6 seconds. All GTS models feature a top speed in excess of 300 km/h. The frontrunner at 312 km/h is the Coupé with manual transmission and rear-wheel drive. Despite the increase in performance, the GTS remains efficient - the 911 Carrera GTS with PDK, for example, consumes only 8.3 l/100 km according to the NEDC. This corresponds to CO2 emissions of 188 g/km. The GTS models stand out within the 911 model line not only in terms of technology, but also in their visual design: All of the vehicles are based on the wide all-wheel-drive chassis, which measures 1852 mm even on the rear-wheel-drive models. The new Sport Design front apron emphasises the sporty character. The front end is aerodynamically optimised. A low front spoiler and increased rear spoiler extension height further reduce the lift forces on the front and rear axle compared to the Carrera S models. On the rear, the GTS is unmistakeable: smoked tail lights, silk-gloss black air intake grille and central black twin tailpipes of the sports exhaust system, which is included as standard. A new black trim strip between the tail lights characterises the rear-wheel-drive models. The light strip is reserved for the all-wheel-drive models. Sport Design exterior mirrors, 20-inch wheels with central locking device painted in silk-gloss black, plus GTS logos on the doors complete the side view. The characteristic Targa bar, which is supplied in black for the first time on the GTS, also lends the 911 Targa a particularly distinctive look.